Part of my understanding composition comes from looking at images I have taken and understanding what makes the composition work or fail. This image (already shown on a blog post) is one of my favorite street shots I have taken. 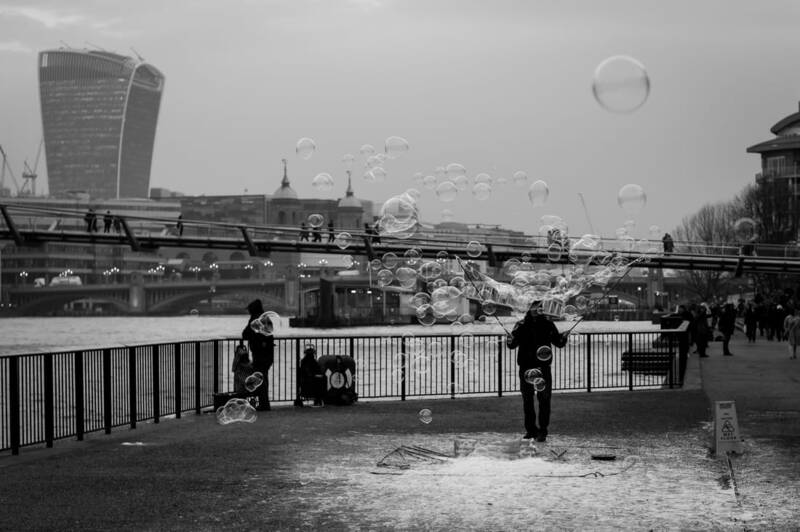 The key aspects that I like about this image is the 3D feel of the bubbles and the strong composition of the entire scene. There is a great deal to look at and I believe I have captured it in the strongest possible way. ​So lets take a deep dive into the image and see what was done well in order for me to be able to replicate it. 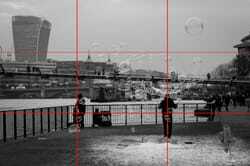 Here we see the image with the Rule of Thirds grid lines visible. 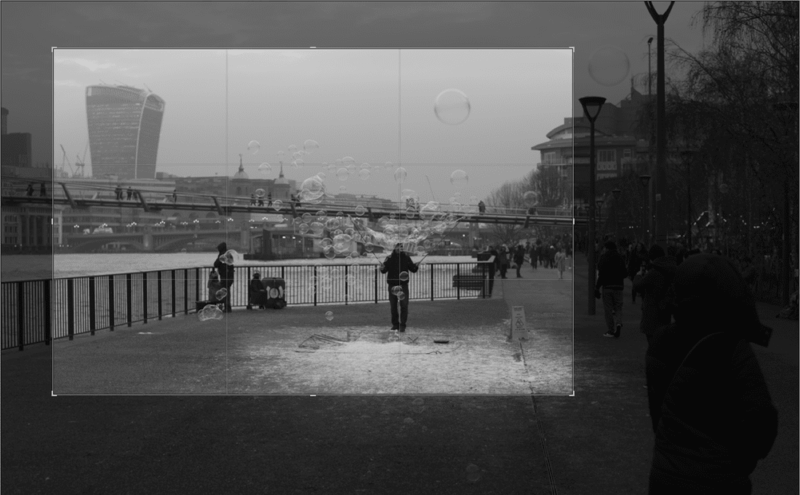 The main actor in this image (I call him the Bubble Man) is in a very contrasty black on the lower right intersection point. The other man looking over the river Thames, is on the lower left intersection point. The oddly shaped building off on the far left of the edge does not lay at an intersection point but keeping it near the edge of the photo, and it being the only object on the upper third of the image draws the eye. Finally the bubbles help bring the eye to the bridge in the background. Compositionally this is as powerful of an image as I feel I could have made given the different elements in the shot. But this is not how I composed the image initially. Lets take a closer look at the original image as shot. I will try to show a few of the before and after shots as well to show why I selected this one. First, note that it is late in the day. The sun has set and my day of shooting was coming to an end. Colors are muted with only the bright yellow sign and the green plastic tub giving us any color. I picked this image because there are no bubbles in front of the building off to the left. I have a clear view to the Bubble Man and the man to the left seems to be looking over the river in a pensive manner. My problem is that I was set too far to the back with a 35mm lens on the Leica ME. The focus point was set on the Bubble Man. Since color was not adding anything to the image I decided to make it B&W. A simple, standard conversion to B&W. The whites are a bit dull and the black do not pop so some adjustments are needed but first the composition is crying for some attention. Using the rule of thirds I cropped down the image. I liked how the building is in the upper left quadrant and the lone bubble is in the upper right quadrant. Now all that is left is some levels adjustment, a bit of vignetting and we have ourselves an image. Very little post processing involved, a clean, straight photography that captures a street scene in the strongest way possible. Below is a snapshot of the contact sheet via lightroom. The first image I was trying to capture the people playing with the bubbles. I tried this for the first five images. 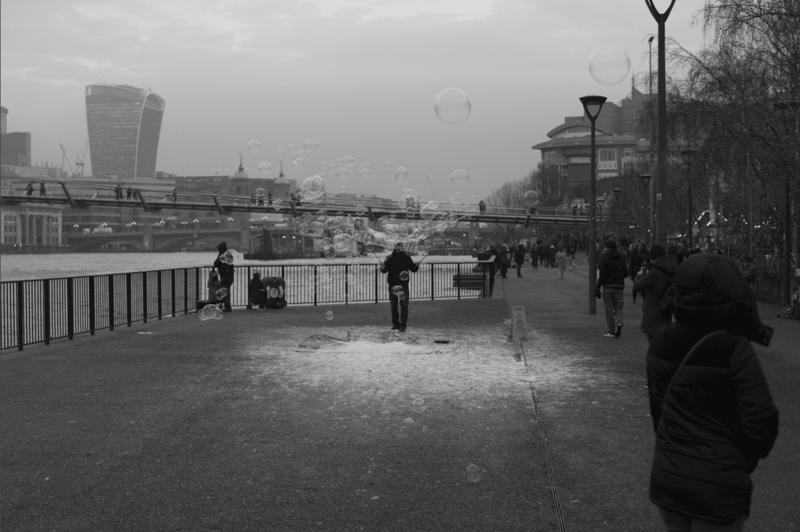 I then moved in front of the Bubble Man with the wind bringing the bubbles towards me. The people had cleared, just me and the Bubble Man. Images 282 through 285 had the bubbles in the wrong spots. Either in front of the building, above the building or not enough bubbles. Image 281 was perfect. After spending five minutes looking at the scene, muscles tired of a full day of shooting all around the London area, and my memory card almost full I managed to capture a 1/180th of a second capture that made the entire day a worthwhile investment.